It’s most definitely pizza weather here at Chez Foti. We’ve had seemingly ceaseless rain, gales and miserable cold for way too long now, since New Year’s Day to be exact. And it’s getting kind of depressing now, in a British wintery kind of way. Our garden is one big muddy swamp and the wee pond a lake, just a shame we don’t have any duckies to appreciate it. Bet they’re the only ones happy round here. And the forecast for the next week is still more rain, a little snow, and grey, grey, GREY. AHRRRRRR. Where’s that gorgeous south of France sunshine and glorious blue sky that amazed and cheered me through the last two winters? OK, enough said, weather rant over (well I AM English!) and on with a couple of recipes to insulate against the outside nasties. 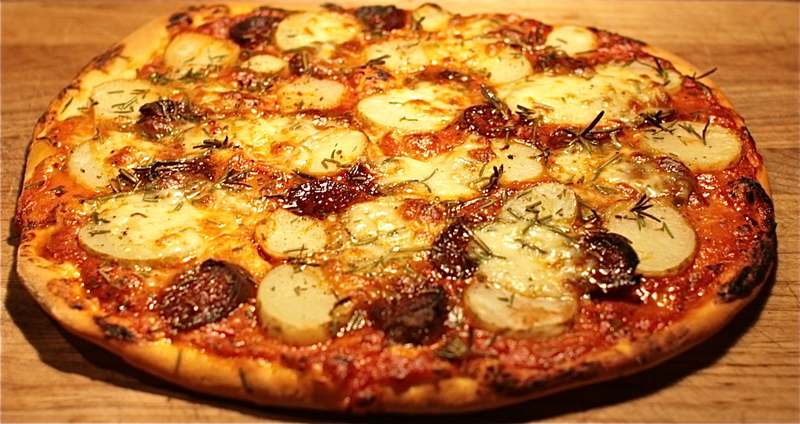 You really can’t get much better winter warming and cheery fodder than a homemade pizza, especially a heftily insulating one with a gutsy topping of Potatoes, Chorizo and Rosemary. Admittedly not one of my healthiest of recipes, but hey ho everything in moderation, and it is rather good. And if you want to omit the Chorizo it’s equally as tasty with just Potatoes and Rosemary. Don’t be put off by the way with the idea of potatoes on a pizza (and try not to think about the carb overload), they really work! Living so close to Spain Chorizo is cheaply abundant in these parts and I cook with it regularly, though much more so in the winter. It’s one of my staple store cupboard ingredients and gets used to liven up many an Omelette or Tortilla, Salad (Chorizo & Manchego Salad), Veggie Side ( just a little is fabulous sauted with Cabbage, Chard or Spinach and even roasted with Pumpkin or Butternut) or Soup (Butternut Squash & Chorizo Soup with Chorizo Croutons, Caldo Verde). And then there’s obviously Paella and other rice based dishes that it works so well with. But there’s no qualms about it, Chorizo’s not the healthiest choice of ingredients, but a little really does go a long way in the flavour stakes and it can be used remarkably sparingly. Though perhaps, ahem, not so sparingly on this particular pizza! 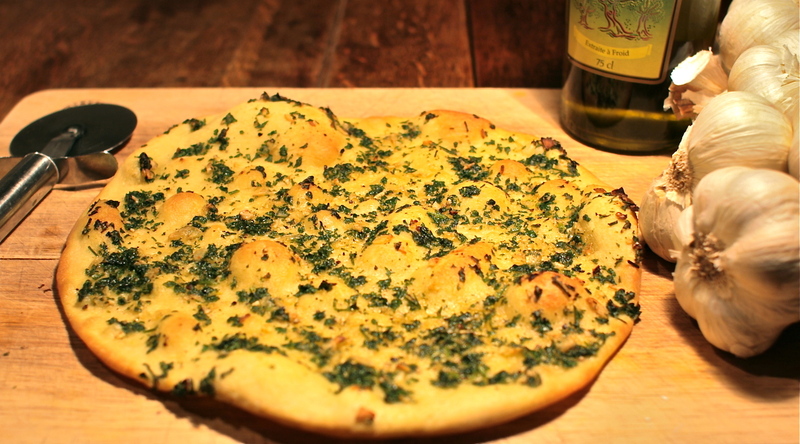 And I also have my favourite Garlic Pizza Bread, made exactly in the same way as pizza but simply containing a topping of Garlic (lots of), fresh Parsley or Rosemary (lots of) and good quality Extra Virgin Olive Oil (again LOTS OF). It’s that simple. Whenever we have a pizza night I always start with one or two of these naughty little herby numbers to get things going. And it’s equally as delish with rosemary or parsley, just go for what you fancy or happen to have in, but be generous! I shall be entering my herby post to Karen of Lavender & Lovage’s February Herbs on Saturday challenge. 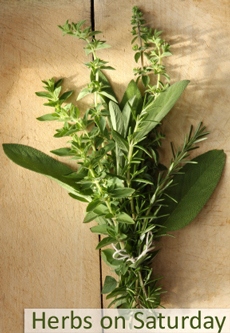 a few sprigs of Parsley or Rosemary, leaves removed and roughly chopped, be generous! Pre-heat your oven to as hot as it will go. Place your pizza stone or baking tray in the oven to heat up. Start with making your oh so simple topping. Crush the chopped garlic with a little salt using the flat edge of a large knife. Mix the garlic with the olive oil, a generous amount of black pepper and the parsley or rosemary. Leave to infuse while you prep the pizza base. Roll out your pizza dough to your desired size and thickness. I like mine very thin, particularly as this is only an appetiser. 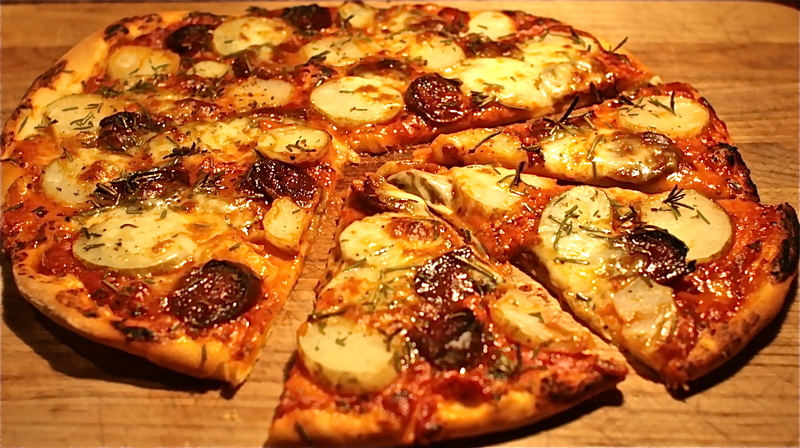 Place on your hot pizza stone or baking tray. Evenly spread over the garlic and herby oil and place in your very hot oven for a few minutes until golden and crisp. It should only take about 5 to 8 minutes and watch as it can burn very easily. Drizzle with a little more olive oil, slice and serve. 150g of small Potatoes, washed but with skins on, waxy ones work the best but any will do really! Cook the potatoes until almost tender. Once cool enough to handle slice. Now for the pizza. Roll out your pizza dough to your desired size and thickness. I personally prefer mine very thin. Place on your hot pizza stone or baking tray. Smoother the base with your tomato sauce, followed by an even scattering of the chorizo, potatoes, rosemary and mozzarella. Finely add a generous grinding of black pepper and a little salt. 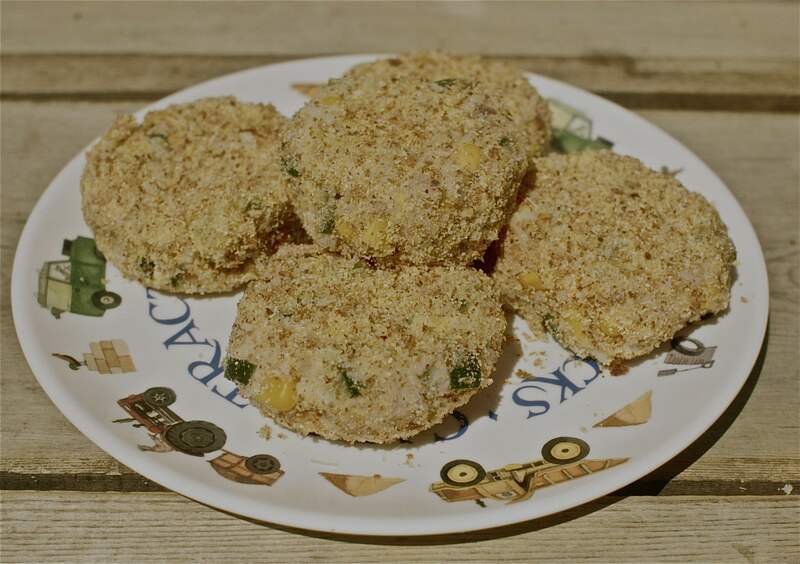 Place in your extremely hot oven and cook until crisp, golden and bubbling all over. This could be anywhere between 5 and 15 minutes! Our woodfired bread/pizza oven usually takes less than 5 minutes and the electric oven around 10. Slice and enjoy. With a salad if you want to feel just a little less indulgent! Heat the oil in a medium saucepan on a gentle heat and fry the garlic for a few moments, ensuring you do not burn the garlic. As soon as it takes on any colour and you can smell it cooking throw in the tomatoes, sugar, salt and pepper and give everything a good stir. Cook gently for about 20 minutes, stirring occasionally. Taste and adjust seasoning to suit. You can either use the sauce as it is or blitz with a stick blender or processor for a smoother texture (I rarely bother!). 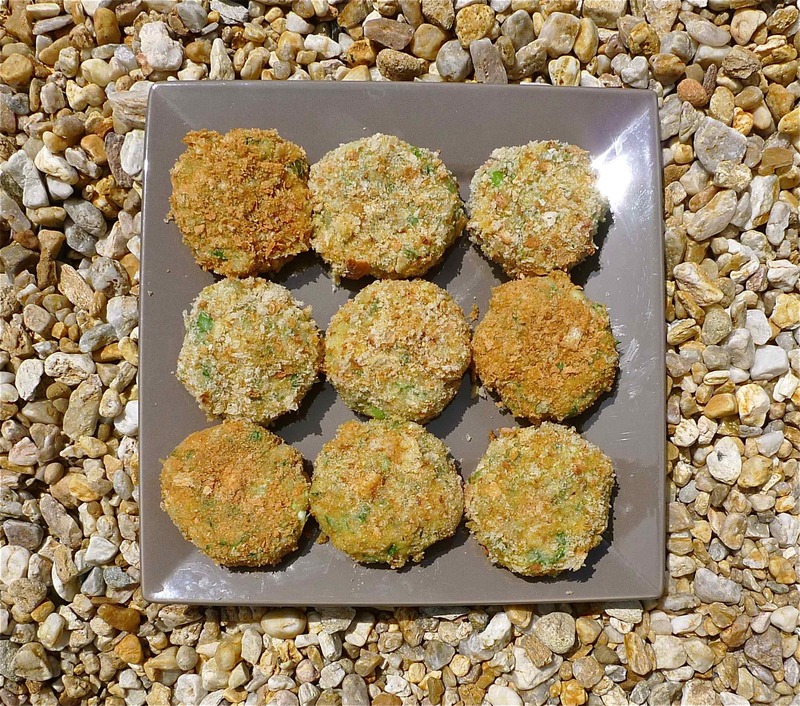 We seem to have been eating quite a bit of meat lately, at least on the cyber world of the blog we do anyway, and I thought it time for a few more veggie dinners especially as my veg patch is busily coming into its own. 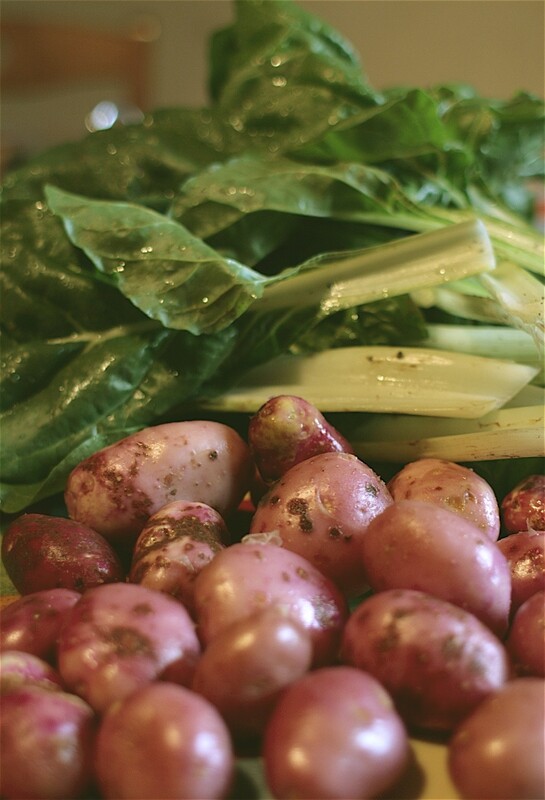 This was one of our first ‘free’ dinners of the year with the two main ingredients, swiss chard and potatoes, both being picked and dug fresh from the garden minutes before. 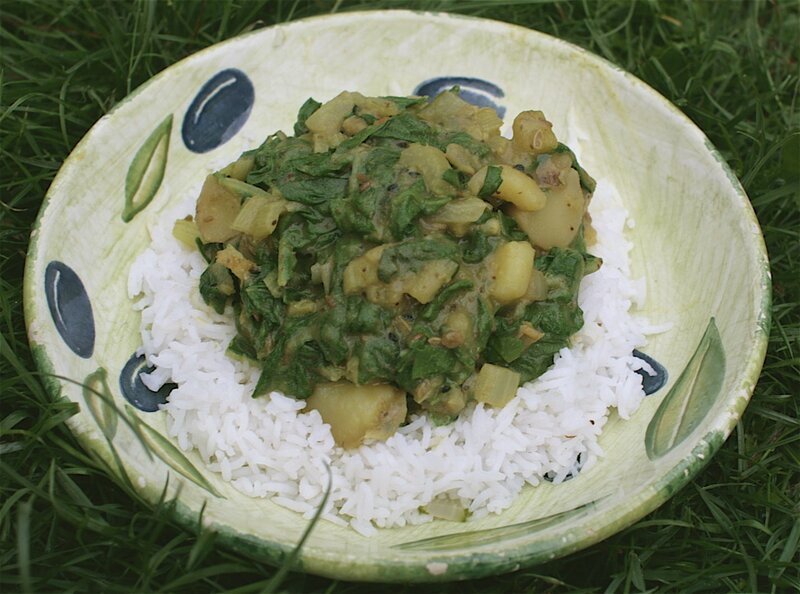 In fact these were our first potatoes of the year, and I can think of no better dish right now to celebrate them more than this fabulous curry. It still gives me a buzz to eat things I’ve grown myself and I’m convinced they always taste just that little bit more amazing. And it goes without saying they’re naturally all 100% organic. The recipe, at least in the main, came from the lovely Nisha Katona of Curry in a a Hurry and her maa. Weirdly enough I was thinking of making a chard curry when would you adam and eve it, up popped a tweet from Nisha about her maa’s chard curry video. I watched, laughed (her maa’s a star! ), absorbed and set to to make my own using all the same spices but guessing on quantities. So my apologies now to you both if I’m way out but the resulting curry was no less than wonderful in my opinion. And further apologies to maa that I didn’t use mooli, there’s no way I’d be able to source it in rural and notably un-multicural rural France! 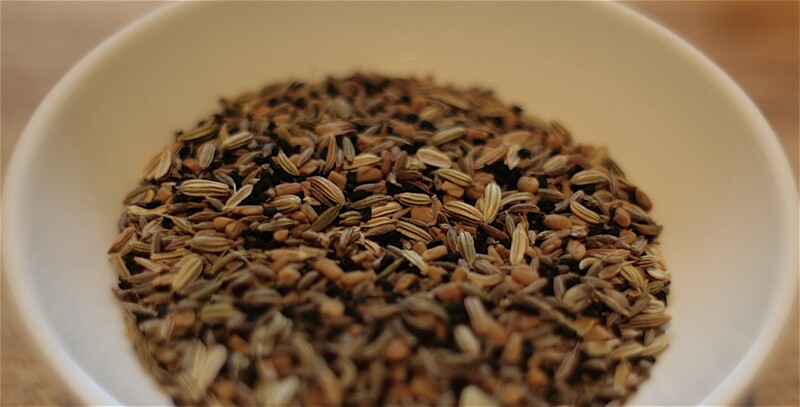 The spices I was lucky enough to have in, and I could even make by own fabulously fragrant Indian 5 spice seed mix called Panch Phoron (equal quantities of fenugreek seeds, cumin seeds, nigella seeds, fennel seeds and celery seeds, the latter added to replace the traditionally included black mustard seeds that I didn’t have). 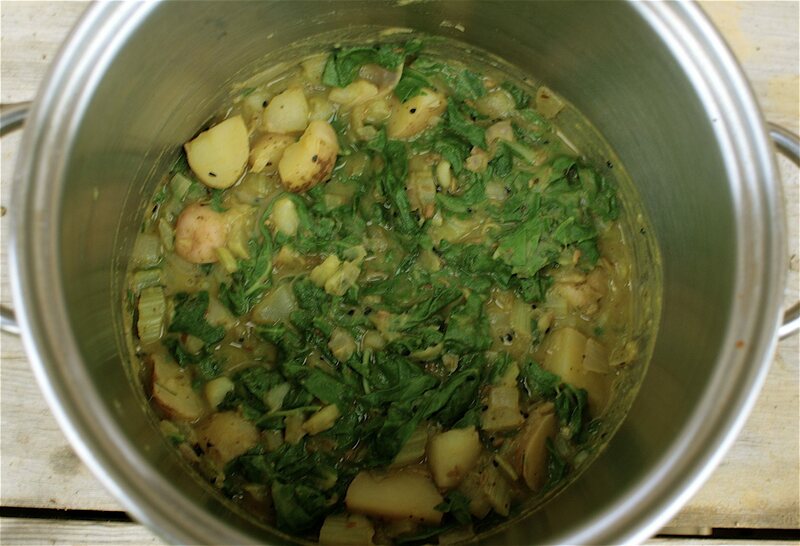 I’m thinking you could happily use any veggies in this curry substituting part or all of the chard or spinach, but I was on a mission to use up as much chard as I could in one dinner so kept it simple. 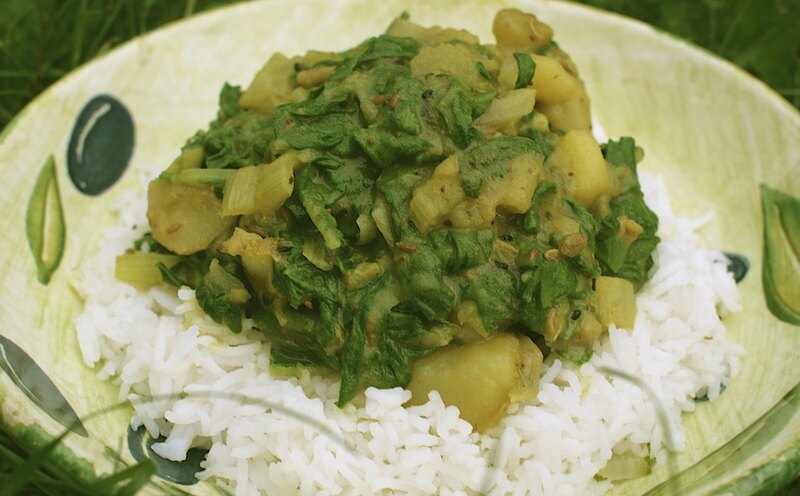 Great as a very healthy main served with steamed rice and/or chapattis or as a side accompanying other dishes. Heat the oil in a large saucepan and throw in the 5 spice. Cook for a couple of minutes or so until you can really smell the spices, but not so much the spices blacken. 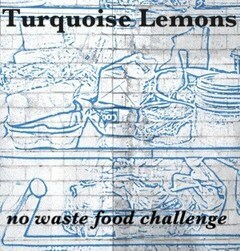 Tip in the onion, potatoes (and any other slow to cook veggies you may be using) and whole dried chillies. Cover and cook for about ten minutes until almost soft, stirring regularly so nothing catches, and adding a splash of water rather than more oil if the pan dries out. Meanwhile prepare your chard or spinach. If using chard tear any thick stems from the leaves, slice the stems and shred the leaves, keeping both separate. Shred the spinach. Throw in the chard stems to the curry and cook for a few minutes. When the potatoes and chard are soft and cooked through add the chilli powder, turmeric, salt and shredded chard leaves or spinach. Cook for a moment or two longer until the leaves are wilted then take off the heat. Season with the thinned down mustard and a little more salt to taste. 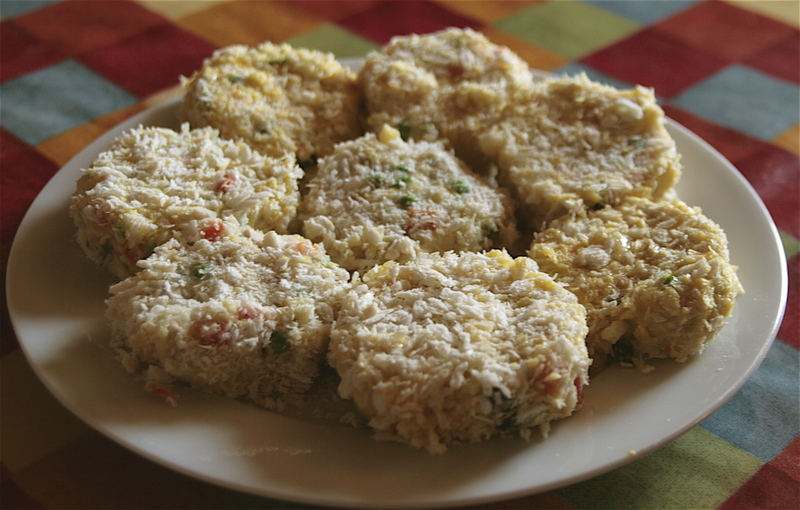 Serve with steamed rice and/or chapatties, lovely with a little homemade mango chutney on the side. Be sure to check out some of Nisha’s excellent home curry making videos, a great way to quickly and easily learn how to cook authentic indian fodder. Mussels are a real treat in our house, though being as cheap as chips and abundant as they are there’s no real reason for this. They also happen to be my husband Philipe’s absolutely most favourite dinner, but only with a simple Mariniere sauce and served with a mound of chips and plenty of fresh bread on the side to soak up all the lovely broth. Plus a little bowl of homemade mayonnaise. Whilst I’m sure our kids would love Moules Frites too, they’re a grown up late night treat in our house to messily and greedily tuck in to when the kids are safely tucked away in bed. The fiddliest bit of cooking mussels is in preparatory cleaning and de-bearding. It really is worth taking the time to thoroughly clean each individual shell and pull off any hairy ‘beards’, at least if you want to up your chances of avoiding poorly tummies. In doing so discard any broken or open shells. Once this fiddly task is done they’re unbelievably easy and quick to cook. 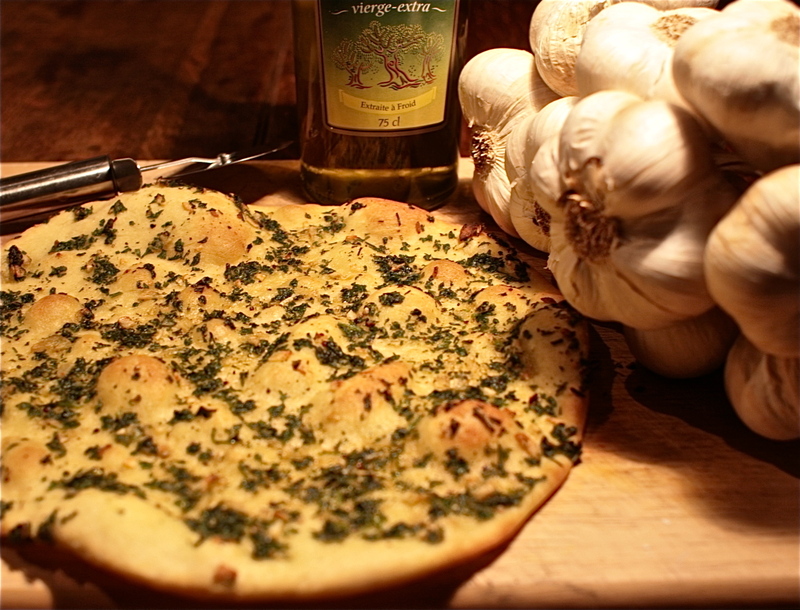 Traditionally Marinieres sauce is made with shallots, garlic, fresh herbs and white wine. I tend to add a little creme fraiche or double cream to mine, but feel free to omit if you don’t do cream sauces. I love using tarragon with it’s slight note of aniseed, but if you don’t have any to hand it’s just as nice with only parsley. I cook my own chips to serve with mussels, but as I don’t have a deep fat fryer mine are more healthily baked in the oven. And they really don’t take long to cook either, parboiled for 4 minutes then roasted in a little sunflower oil in a very hot oven for a further 15 to 20. Barely longer than shop bought oven chips yet so much better, they really are surprisingly good. Start with thoroughly cleaning all your mussels, scrubbing the shells and removing their hairy beards. Discard any with broken or open shells. Set aside until you’re ready to cook them. Preheat your oven to 230°C, or as hot as it will go. 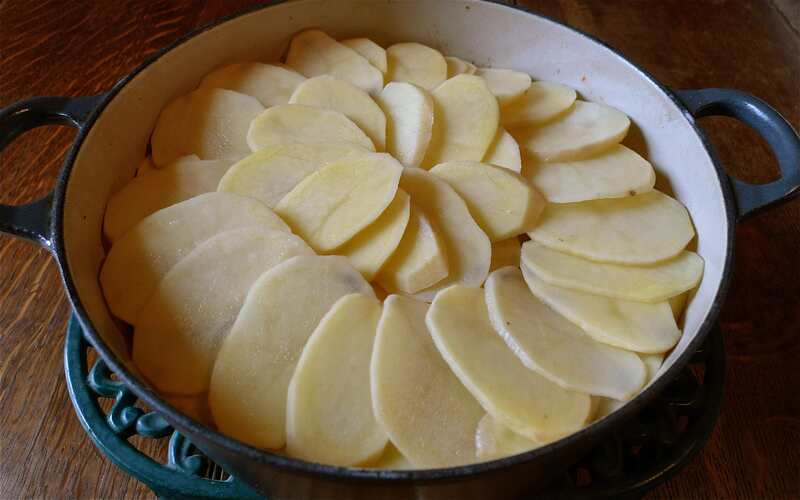 Peel and slice the potatoes into chips, cutting first lengthways into 1cm slices, then into 1cm thick chips. Unfortunately any thinner and they’re a bit too tricky to oven cook. Place the chips in a saucepan of boiling water and simmer for 4 minutes. Drain well and leave to steam for a couple of minutes. Carefully empty the parboiled chips out onto a large baking tray and coat them evenly in 2 tablespoons of sunflower oil and a little salt and pepper. Place in the hot oven for 15 to 20 minutes, turning at least a couple of times during the cooking time. They’re ready when they’re golden and crisp. About half way through the chip’s cooking time start the Moules Mariniere. Heat the butter and olive oil in a large saucepan (one big enough to easily hold all the mussels, and one that has a lid) and gently fry the finely chopped shallot and garlic for about 5 minutes until very soft, stirring regularly. Add the wine and herbs and a pinch each of salt and pepper. Bring to the boil and simmer gently for 5 minutes. Stir in the cream or creme fraiche (if using) and bring back to a simmer. Tip in the mussels, shake around in the sauce a little and put the lid on. Steam the mussels on a medium heat until most of the shells are open, this should be only about 2 to 3 minutes. Serve the mussels and chips immediately with a pot of mayonnaise and plenty of fresh bread on the side. 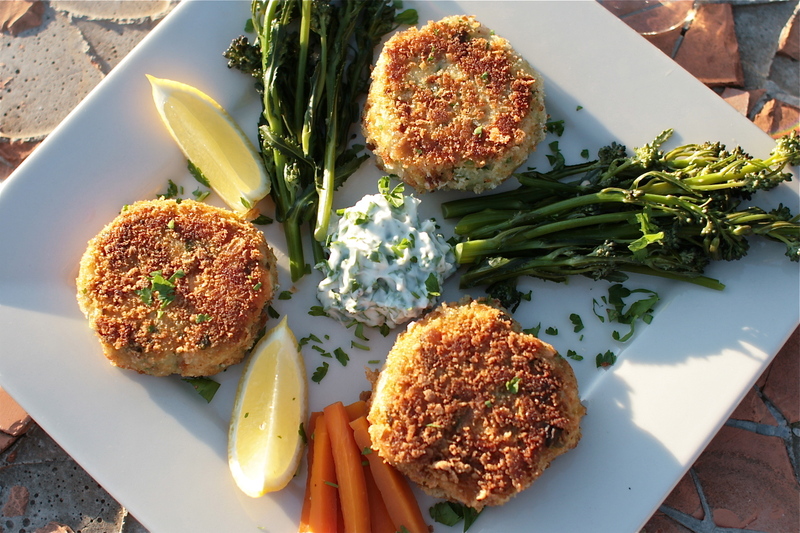 If you like this have you tried any of my other fishy recipes, Salmon Fishcakes with Herby Garlicky Mayo, Fish & Chips with Homemade Mayo, Kid’s Fish Pie or Smoked Salmon & Broccoli Penne? 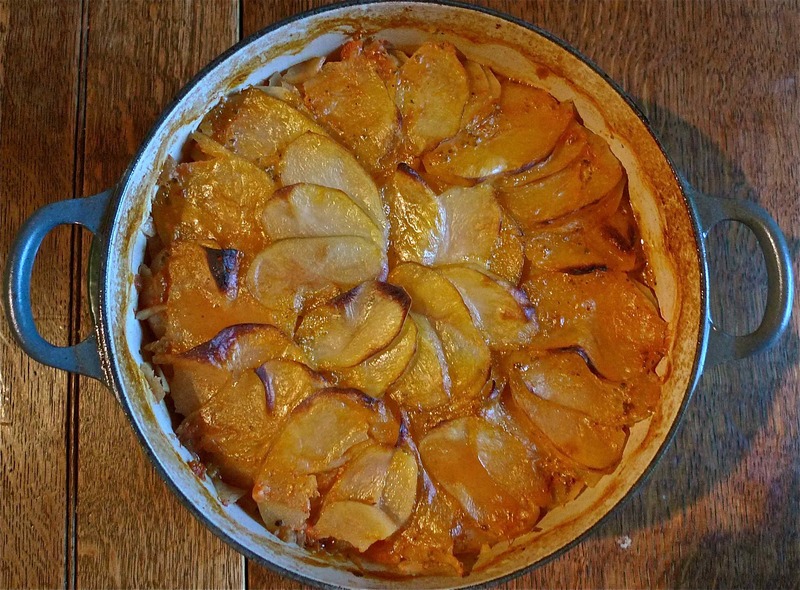 A Tartiflette for your Valentine? 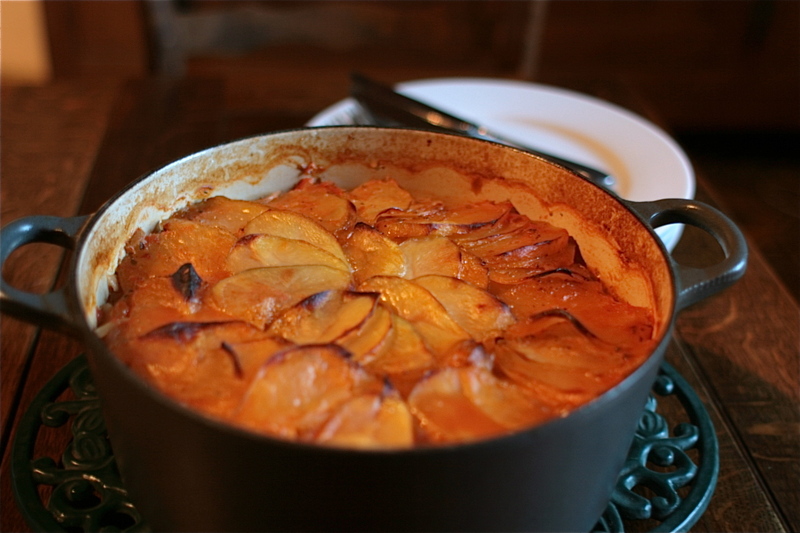 This French classic from the Alps has to be the ultimate in staying in cuddling up in front of the fire cold winter night comfort food. Coupled with a fine bottle of vin rouge, a simple well dressed green salad and plenty of crusty bread this would be my perfect Valentines supper, and I’d be lovingly making this for my husband tomorrow if he happened to be in the same country as me! But alas he’s beavering away at home in France fitting new floors and ceilings whilst I’m camping out with the nippers at my parents house in Herefordshire. Not exactly the healthiest of recipes which is why I’ve left this little gem until February, but nevertheless a wonderful and special treat. Potatoes, lardons (or streaky bacon if you can’t source), meltingly soft onions, cream and oozy cheese and that’s it. Splurge on some top quality cheese here, it’s worth it. Reblochon is traditional but Tomme de Savoie, Compte or Gruyere work well too, or any combination of these. So so simple and divine beyond belief. I defy any bloke not to be chuffed with this super calorific little number! In a large and deep frying pan fry the lardons or streaky bacon in a little olive oil until slightly crisp. Add the sliced onion and fry for at least 15 minutes on a low heat until very very soft. 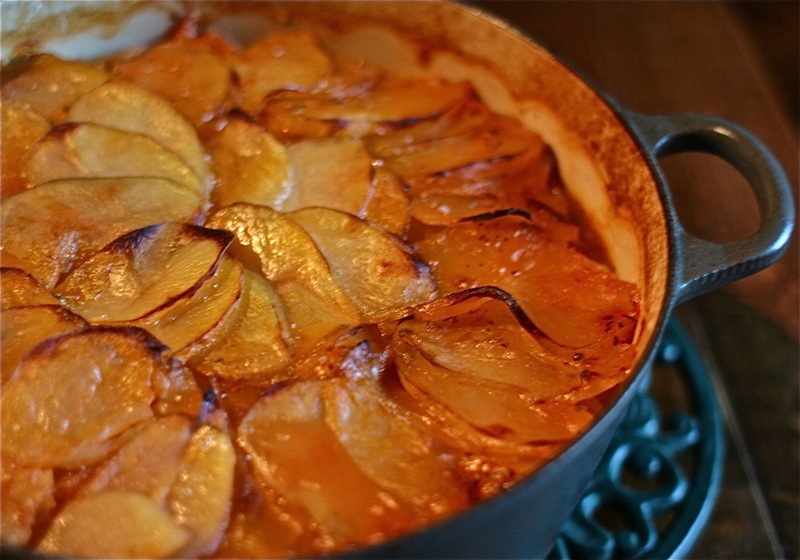 Now stir in the cooked sliced potatoes and continue to sauté until everything is slightly browning. Season with plenty of freshly ground black pepper and a little salt (be cautious with the salt, you may not need any at all) and stir in well. Place in an overproof dish and pour over the cream. 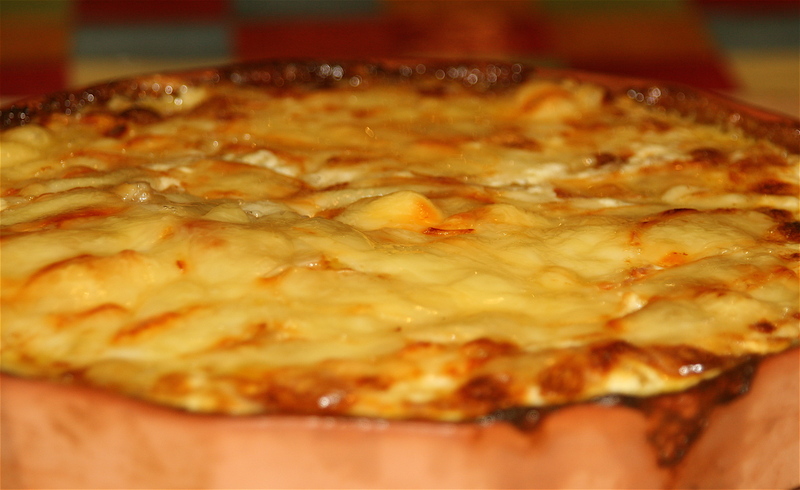 Layer the cheese slices over the top and place in the oven. Bake until bubbling and slightly golden on top. Eat immediately, as if you couldn’t resist! 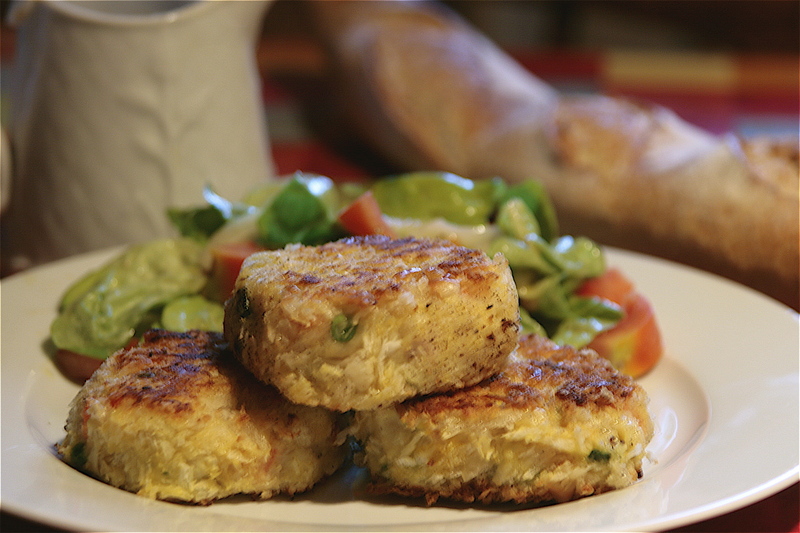 Lovely with a simple well dressed green leafy salad, plenty of crusty bread and a fine bottle of gutsy red wine. This was our Sunday dinner last weekend and inarguably makes my Sunday Food Heaven top 5 list!. 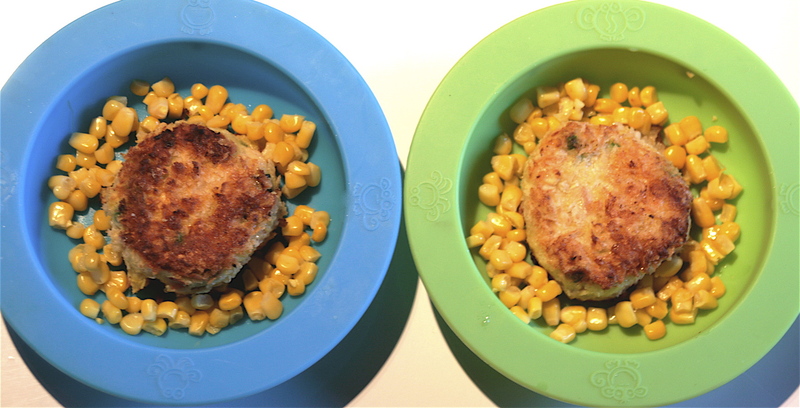 We all LOVED it, and needless to say there weren’t many chickenie leftovers! I’m really into pot roasting meat these days as it by-passes having to use an oven, and as I’m sure most of you are well aware our temporary gas oven is worse than dreadful and best avoided at all costs. I daren’t buy a decent bird or joint of meat until it’s replaced, unless I can pot roast it on the hob. If you have a slightly older chicken (as we had, a gift from a neighbour) then this is also a particularly great way to cook it and retain as much moisture in the meat as you can. Older in age I mean, not old in the sense of it knocking around the fridge for a couple of weeks!. Steamed in plenty of white wine, lardons (or streaky bacon if you can’t source), thyme, bay, garlic and onion, then thickened with a little crème fraiche at the end, this is a rather splendidly rich dish yet somehow light at the same time. I like to serve a mound of fluffy leek and wholegrain mustard mashed potato on the side as well as a simple steamed green veg, and in our case french beans fresh from the freezer (fresh from the garden last summer anyway!). 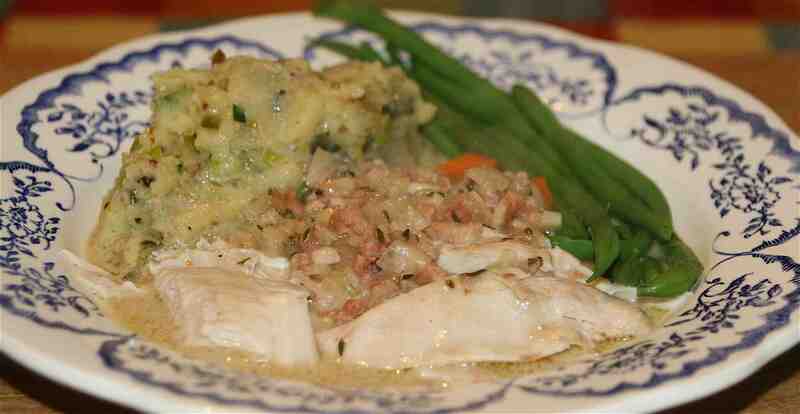 Leek & mustard mash is also great with sausages, a pork joint or chops or just a plain roasted chicken. 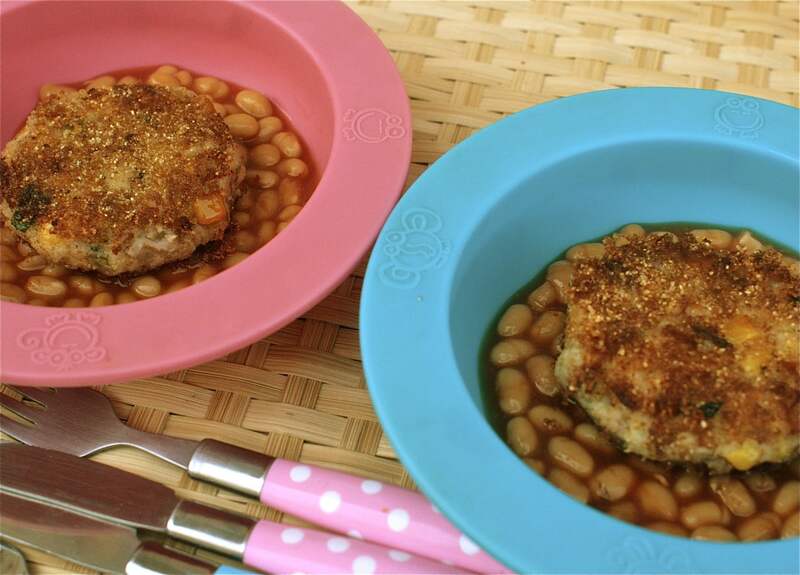 If you happen to have fussy kids (we have one!) 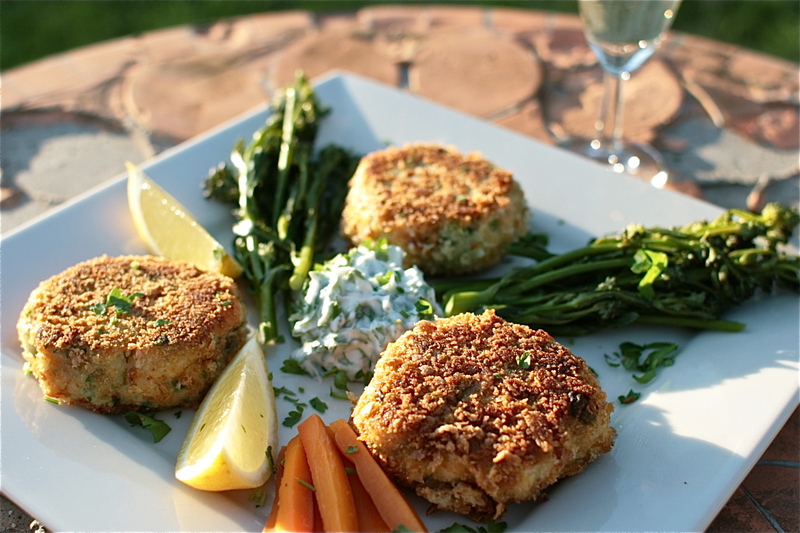 then with very little effort you can adapt this dinner to suit the whole family. If your kids don’t ‘do’ sauces as many seem not to (our daughter recoils with horror at anything other than gravy!) then they can just have the plain chicken, leaving even more delish sauce for those that can appreciate it. 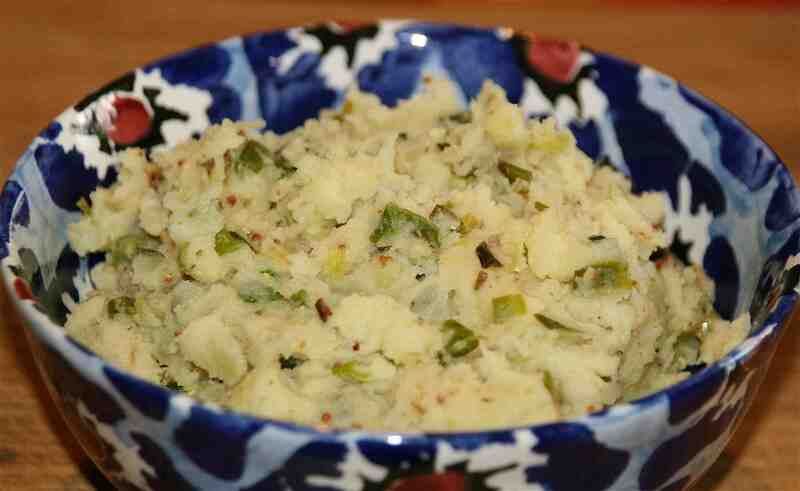 Similarly on the mash front I tend to keep a little plain mash back before adding the mustard and leeks. As it happened they both ate the lot today, sauce and all. Add the olive oil to a very large saucepan or casserole dish (it must be able to easily contain the chicken and have a lid), place on a low heat. Season the chicken all over with a little salt and black pepper, massage into the skin. Place the chicken in the pan and turn every few minutes until it’s golden brown on all sides. Remove from the pan and set aside. Place the onions and garlic in the same pan and sauté on a gentle heat, stirring regularly, for 5 minutes. Add the lardons and cook for a further 5 minutes. Put the chicken back in the pan with the onions and lardons, along with the white wine, chicken stock, the thyme and bay leaves and last but not least a generous grinding of black pepper. Bring to the boil and simmer very gently for one and a half hours with the lid on. The chicken is ready when it falls easily off the bone. Whilst the chicken is simmering away make your mash. Boil the potatoes in a saucepan of boiling salted water. While they’re boiling saute the sliced leeks in a tablespoon of olive oil in a frying pan, stir regularly and saute for about 10 minutes until very soft. If the leeks are catching on the bottom a little too much, add a splash of water. When the potatoes are cooked drain and leave to steam for a couple of minutes to dry out. Mash with a potato masher, mashing in the butter, a dash of milk, a pinch of salt and some freshly ground black pepper. Stir in the cooked leeks and the wholegrain mustard. 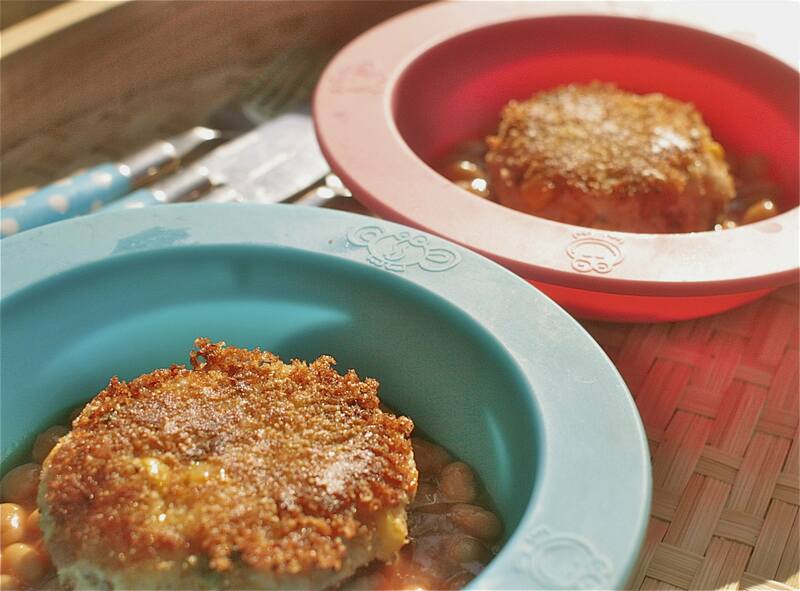 Start with just one tablespoon of the mustard and taste, add more to suit your taste – I like about two tablespoons!. When the chicken’s cooked, remove from the pan and leave to rest in a covered dish or a roasting pan covered with foil, so that it stays warm. Stir the creme fraiche into the sauce and bring back to the boil. Allow to simmer for 10 to 15 minutes until the sauce has reduced and is a little thicker. Pour into a serving jug. Carve the chicken and serve with a generous pouring of sauce over thet top, a mound of mash and a green veggie on the side. Perfect. 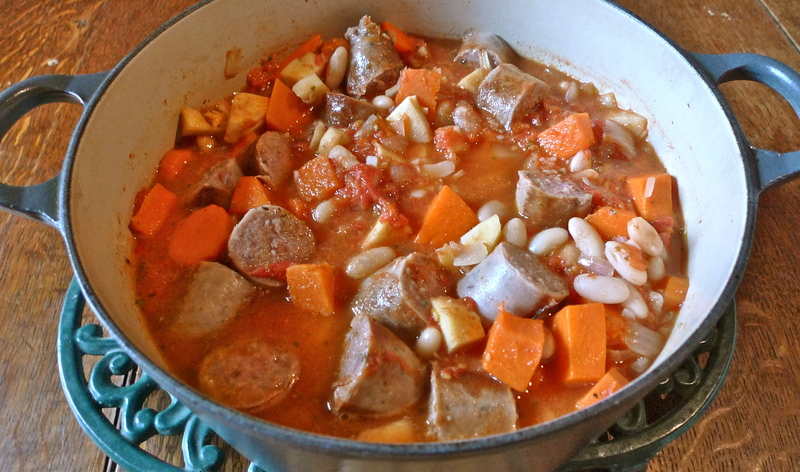 Have you tried my Coq au Vin, Simple Chicken Stew or Chicken, Pumpkin & Borlotti Beans recipes?